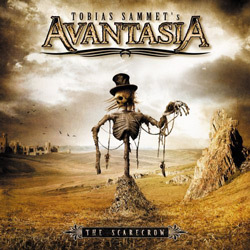 Re: Avantasia - "The Scarecrow"
my view on the album. I posted the album review on my blog before. so, gonna post it here too. One thing I like about this album is that it's not a straight up power metal album. It has a pinch of rock here and there. The bad thing about this album is Tobias Sammet. Oh, I adore the guy for being such a musical genius. Heck, I love Edguy! The thing is, his vibrato could be rather annoying. Prior to getting the album, I checked out the EPK and had some ideas how the album going to sound like. - Not exactly my favourite Khan's moment. I've heard him delivered a better performance. The song started off rather promising, up until Tobi opened up his mouth. He kind of ruined the song. Sorry. Not exactly in love with the chorus either. The song could be better. Two thumbs up for the music, one thumb up for Khan, two thumbs down for Tobi. - The longest song in the album. I have to say I am in love with Jorn's vocal. Seriously, who wouldn't? I have heard a snippet of this song on the EPK. My favourite moment was the last 3 minutes or so of this song. - Again, another song I heard off the EPK. The song is speedier. It sounds like a battle of the vocalists and each one tries to outdo each other. The winner? Definitely not Tobi. At times, I just wish he would shut the hell up. - The first song I heard off the album. Watched the video on you tube. My first impression was that the song sound pretty much like Bon Jovi, which is not entirely a bad thing although I have never been fond of Bon Jovi. Once I listened to the whole album, the song kind of grew on me. I love the fact that it's different from other tracks in the album and rather unexpected. Note : One song that I actually was impressed by Tobi's vocal. Maybe he should stick singing like this. - What would happened if one day Celine Dion and Richard Marx decided to sing together in a metal album? This song. It's not a bad song. I like this song. I have never been fan of Amanda Somerville before, but this song is too beautiful to be ignored. Oh! did I just compare Kiske and Tobi with Richard Marx? Haha. We all know those 2 own Marx. It was just a fucken analogy. - I didn't listen much of this song, but I like it. I like the rawness of Jorn's vocal. The raw and rough sound is of course interrupted by Tobi's somewhat gay moment. Really, at times he sound so fucken' gay. I have nothing against him. The second verse sounded better, until he hit that gay vocal again. It's a good song. A must listen. - Another good song. Alice cooper makes this song works. Lyrically, erm, a bit bad. Seriously, "All you boys and girls, welcome to my wonderland". Downright corny and lame. Tobi is back with his gay vocal which I didn't find annoying at all. He made it work, it actually blend well. - Heard this song off the EPK. I like this song. When I saw the EPK, this song really stood out in my memory and one of the reason why I wanted to give this album a shot. I think the chorus bits is the best, amongs others in the album. A must listen. One hell of a song. - Bob Catley and Tobi. Two men singing a slow song. Which reminds me of Mushroomhead(two male singing slow song together. LOL). I don't know. The prospect of two male singing a slow song is a bit off to me. Hehe. Not exctly the best song in the album. I tend to skip it. - My favourite track. I love Oliver Hartmann's singing. Really do. At times, I wonder how would this song sound if he sing it alone? sorry Tobi. Haha. nevertheless, one of the best song in the album. I love the chorus, I love the verses, I love the music. Just everything. - I first heard this song when I watched the video on YouTube. My first impression was - Sucky much?. It's a rockish number which elitist would definitely hate. I still say it's the weakest song on the album, but not a bad song.